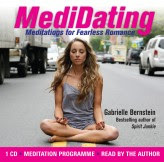 You might wonder why I'm reviewing something offering "Meditations for Fearless Romance" - which is the subtitle of a new CD called MediDating by American life coach Gabrielle Bernstein. Am I bored with my partner? Am I on the look out for someone new? Actually, no, I'm quite happy with my current relationship, but a single friend recently confided with me that they are looking for love. They asked me if I had any advice - I said I'd think about it and come up with something. The very next day I was offered a review copy of this self-help CD and I'm a great believer in synchronicity. Publisher Hay House says on its website: "In this hour-long guided meditation, self-help guru and bestselling author Gabrielle Bernstein helps you release romantic illusions, overcome fears and insecurities, activate your attracting power and manifest love into your life." You might be relieved to learn that it isn't a single, hour-long meditation. That would be a bit daunting, I think. It is a series of 11 short tracks. The first six meditations are designed to help clear romantic fears. The last ones use visualisation techniques to help you attract love into your life. The idea behind the meditations is that many people carry disastrous relationship experiences from the past into the present. These can sabotage the possibility of creating a healthy new relationship, keeping one rooted in history instead of living in the now. The tracks on the CD encourage you to relax and develop more self-awareness to learn to let go of resentments and be open to new relationships. Before offering the meditations to my friend to see how they worked for her in her quest for love, I decided to give them a go myself. I was surprised to find that they are actually quite useful for those who already have a lovely partner. It is easy to bottle up resentments even in the best relationships. As I listened, I found myself thinking of things I really ought to be discussing with my lover - and realising that I do take them just a little bit for granted. Time to bring back the romance I think. As for my friend - well, she still hadn't connected with the love of her life when I spoke to her a week after giving her the CD, but she did say it offered a different perspective to the dating experience. You can order MediDating: Meditations for Fearless Romance from Amazon or buy it from Hay House.